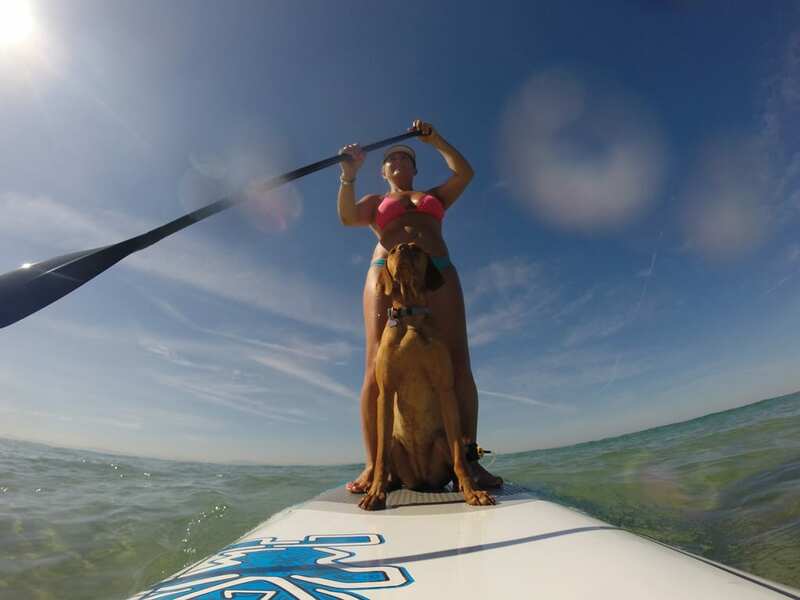 Unable to resist the nagging power of social media any longer Kate Burbidge decides to take up paddle boarding and finds it, despite the ups and downs, an ultimately rewarding experience. “Get up, stand up, put your paddle in the water and just enjoy the scenery,” the words of my instructor made it sound as simple as the lyrics of a Bob Marley song. And yet at first it seemed so unattainable. 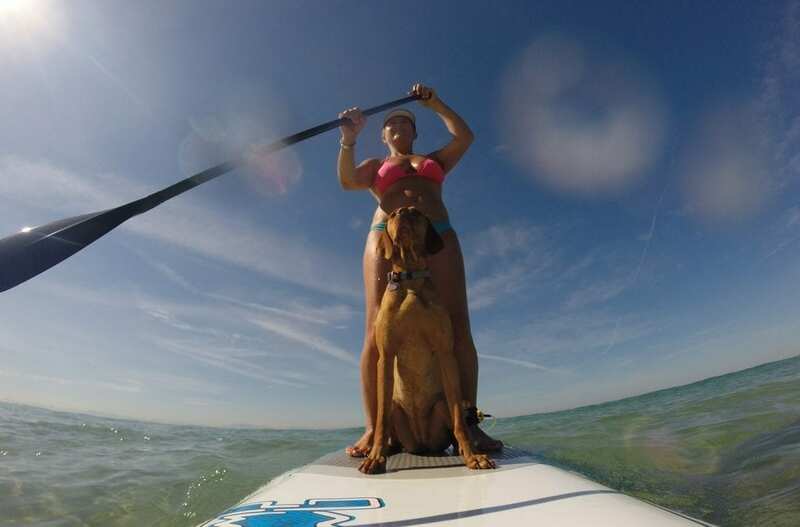 Paddle boarding, or stand-up paddling (SUP-ing) is increasingly popular across the globe. Wherever there is water, SUP-ing presents an opportunity to get out on it with relatively little equipment and training. Certainly it is quicker and simpler to pick up than surfing – standard, wind or kite – and doesn’t require waves or wind to aid momentum, in fact it’s best without. Even in the UK, which was apparently quite a latecomer to this particular water sport, there are many highly recommended spots and guided trips for all abilities. The beaches of my own home county, West Sussex, with their calm shallow waters and gentle, predictable tides, are recommended for beginner level coastal SUP-ing. The Lake District offers many opportunities for guided and independent trips around its waters. The Pembrokeshire coast and the Wye valley both come highly recommended for board based sightseeing. The River Cam sees SUPs sharing its leafy length with traditional punts. As with any water based activity, common sense – avoid areas of heavy water traffic – and the ability to swim are important. And, as I was to learn, a little tuition goes a long way. 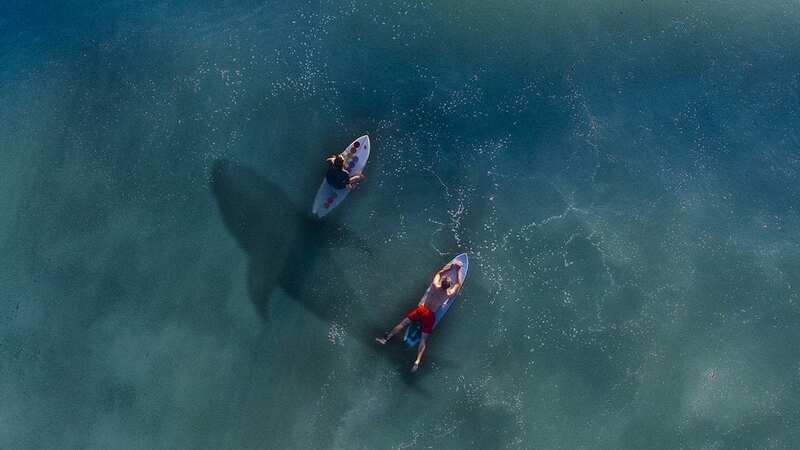 I had often mentioned – every time I saw yet another Facebook post of various friends paddle boarding – how much I’d like to try it. After all it didn’t appear to involve the quick fire agility of surfing or the sheer insanity of purposely capsizing a kayak. Paddle boarding is one of those things that is suddenly everywhere, every beach, river, lake and canal in almost any given country. How hard could it be? The final straw came one August Bank Holiday weekend with yet another paddle boarding post. Set on a sunny beach, with bright blue skies and calm clear seas and… just down the road. A board and kayak hire company had set up a pop up shop on my doorstep. And to my eternal gratitude they were even offering beginner lessons at sea due to the mirror-like conditions. Mirror-like conditions that disappeared as soon as I set foot on the shingle. However the breeze was still light, the swell was all of 5cm and I promised not to be put off for life if it took me a while to get the hang of it. I was duly kitted out with wetsuit and buoyancy aid – a legal requirement at sea – and, after a brief dry run through of paddle handling and the various board positions, off the instructor and I set. I can swim and I float like a cork so the sea, particularly on a good day, holds little fear for me. This was a good thing as I spent most of the first part of the lesson in rather than on it. Standing up, even slowly, when the water is less than dead calm is much harder than you’d think. Still, I managed it for a whole ten seconds the first and only time. I nailed getting back on the board; I had lots of practice. After what seemed like the hundredth time of half standing, hands still on the board, bum in the air and wobbling like a neoprene-clad jelly, my legs declared themselves unfit for purpose and I put what remained of my energies into practicing basic paddling and turning techniques, on my knees. The rest of me gave up the unequal battle soon afterwards and I headed back to the beach, promising to book in for a second lesson. If paddle boarding is not for you, why not learn to surf. Read: Surfing Begins at 40. True to my word, three days later I was back on a paddle board on a quiet and truly, this time, mirror-like stretch of water. No bumps, no breeze, just a perfectly balmy late summer evening and a virtually deserted canal. I was much encouraged. So much so that I astounded myself by standing up almost immediately. And staying there for most of the two-hour session. 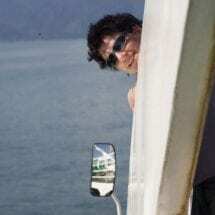 I mastered turning quite readily, albeit with the speed, elegance and turning circle of a cross channel ferry. I even mastered more than one basic means of turning, although remembering which way I would turn proved more problematic, thus rendering direction a matter of luck rather than judgement. But at least I could manoeuvre. Relaxing makes things gentler on both legs and mind. Paddle boarding even began to feel natural. I found myself doing things automatically, not needing to think about each action, quite happily slipping along, imagining this as a regular occurrence. Perhaps I could nip to the pub in the canal basin for a swift half and slide back again as the sun set? The more automatic paddle boarding becomes, the more your confidence grows and the more you’ll enjoy the scenery and chatting with companions. However, become too relaxed too soon and … well, at least those remounting skills will come in handy again. 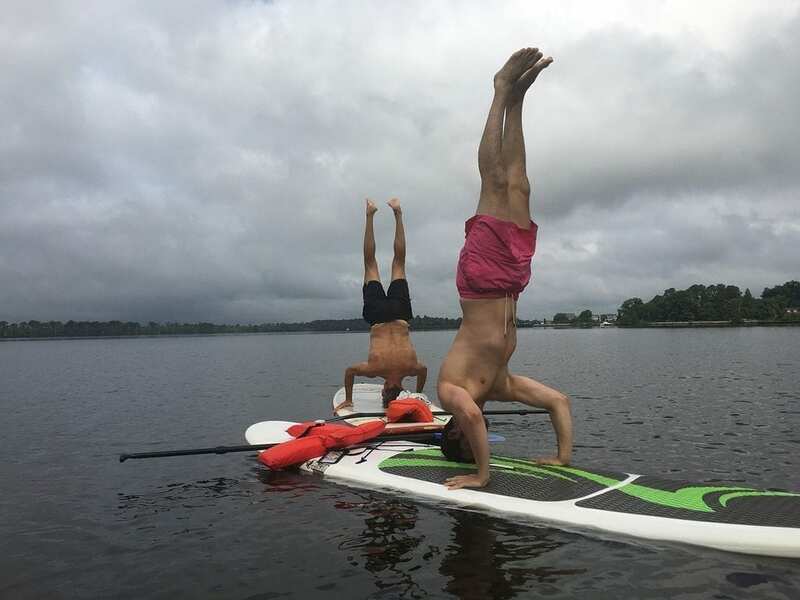 Not only is paddle boarding a fantastic way to sightsee and a pleasingly easy skill to master, it is one of the best core strengtheners and all body workouts there is. You can even take your dog with you. So, if that doesn’t justify a pint at the end of the day, what does? For more information on paddle boarding in the UK, visit: https://www.bsupa.org.uk or for paddle boarding locations, click here. Cover photo by Claire Newman. Born in South Wales and rapidly relocated to Beirut, Kate has always enjoyed wandering. The travel bug took her early, having had the good fortune to be taken around various cultural highlights of Europe as a child. Kate enjoys sampling different cultures, food and languages, which is pretty much how she ended up in SE Asia; where she stayed for several years. A grammar authoritarian, walking thesaurus, art nerd and beach bum, Kate has since returned to Europe but she’s not ready to hang her all terrain flipflops up just yet.